In 1999 UCA SOPPEXCCA began to join the international coffee market. In the beginning it was 68 men and women coffee producers who participated in this process. In the course of the following years more and more coffee planters took part in this project. Today 650 men and women producers with their families are organized in 15 cooperatives in the UCA SOPPEXCCA. The cooperative SOPPEXCCA has developed a model of broadly conceived democratic participation of each and every producer, which proceeds from the respective cooperatives and into which a youth movement is integrated as well. This movement has already produced a lot of coffee inspectors, barristas, counsellors for the improvement of quality, environmentalists and groups of young painters. The youth movement prepares programmes of alphabetization, music and cultural education. 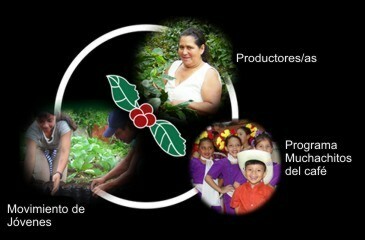 Moreover, SOPPEXCCA has set up a programme which is called Muchachitos del Café ( Children of Coffee ). This pilot project was begun in five schools. Among its most important contents are elaborating alternative structures of leadership, participation, environmental education, culture and sport. The underlying model is based on the sustainability of a humane environment, on the responsibility for one's own organization and on the participation of all spheres to change the living together of mankind in the sense of more harmony and equality of the sexes. This model is applicable in every organization which is interested in the broad participation of its members and in the social actors' thinking and acting progressively. UCA SOPPEXCCA has received various acknowledgements and awards for the quality of its produced coffee and for the high level of cooperation with the men and women producers. The working and living conditions of the members and the standard of education in the referred-to areas have highly improved.